Venez nous rencontrer et découvrir nos aubaines chez le concessionnaire Heuvelmans Chevrolet Cadillac LTD. Voyez ce superbe véhicule Chevrolet Cruze 2014 usagé près de Chatham. Inspecté et certifié par nos techniciens d'expérience, ce véhicule Vert indique 69017 km au compteur. Ce véhicule Chevrolet Cruze 2014 usagée vous est offert au prix avantageux de 13188 $. Il s'agit d'un véhicule de type Berline, avec 4 portes, une transmission Automatique et une traction Avant (FWD). 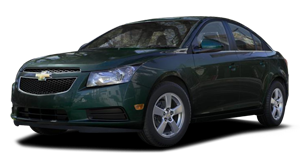 Si vous souhaitez en savoir plus sur le véhicule Chevrolet Cruze 2014 usagé à vendre à quelques minutes de Chatham, n'hésitez pas à communiquer avec nous par téléphone au 519 352-9200 ou sur notre site web au http://www.heuvelmanschev.gmcanada.com. Thanks for looking. This 2014 Chevrolet Cruze is for sale on our lot in Chatham. This sedan has 69017 kms. It's green in colour and is completely accident free based on the CarProof Report. It has an automatic transmission and is powered by a 1.4L I4 16V MPFI DOHC Turbo engine. It has some remaining factory warranty for added peace of mind. The Cruze goes beyond your typical compact car. Its modern styling on the exterior hints at the ground-breaking vehicle inside - one so efficient, so safe and so technologically advanced, it redefines the category. 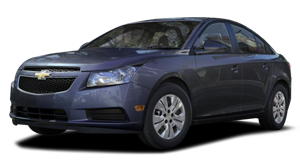 With up to 46 MPG highway, Cruze is the first car in it's class with 10 standard airbags, helping earn the 2014 Cruze a 5-Star Overall Vehicle Score from NHTSA. Our Cruze's trim level is 1LT. Cruze 1LT offers a host of premium comforts and fun features like Bluetooth mobile phone connectivity, an audio interface, cruise control, a leather-wrapped shift knob, 3-spoke leather-wrapped steering wheel with silver accent, and chrome wheel covers.To apply right now for financing use this link https://gmcldealersecureforms.com/heuvelmans-en/FinancePreQualForm?originalDomain= Buy this vehicle now for the lowest bi-weekly payment of $105.66 with $0 down for 84 months @ 5.99% O.A.C. ( taxes included documentation fee ). See dealer for details. Visit Heuvelmans Chevrolet Buick GMC Cadillac at for a great deal and a great selection of pre-owned vehicles. We are located at 755 Grand Ave West in beautiful Chatham, ON. You can even shop with a pre-approval in hand. Using our connections, you can obtain a pre approval which allows you to choose from our many great vehicles to find one that suits your needs best. Our staff are professional, knowledgable and most important - here to make sure that you find the vehicle that suits your needs. Give us a call today at . Come by and check out our fleet of 80+ used cars and trucks and 130+ new cars and tru"